International Journal of Research in Health Sciences,2014,2,1,126-132. 1,4,5Tutor, Department of Anatomy, NRI Institute of Medical Sciences, sangivalasa, Vishakapatnam, A.P, INDIA. 3Tutor, Sri Venkateswara Institute of Medical Sciences, Tirupati. 5 –Tutor, Mamatha medical College, Khammam, Telangana, INDIA. Introduction: Heart is a hollow muscular organ composed primarily of cardiac muscle tissue that continuously contracts and relaxes. Heart receives blood from right and left coronary arteries. Materials and Methods: In the present study 50 hearts from aborted foetuses (13 – 36 wks of gestational age) were collected. The foetuses were categorized in to two groups of 13 -24 weeks (Group I) and 25- 36 weeks (Group II) gestational age range. 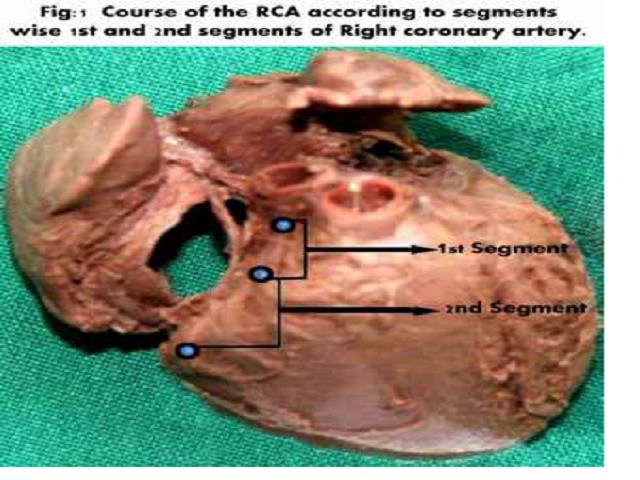 The heart specimens were observed for origin, course and branching pattern of coronary arteries, segment – wise lengths of coronary arteries, coronary dominance, presence of third coronary artery and myocardial bridges. The mean lengths of coronary arteries were compared between 1st, 2nd and 3rd segments. Results: There is a significant increase in the lengths of 1st, 2nd and 3rd segments from group-I to group-II. The posterior interventricular artery was arising from right coronary artery in 56%, left coronary artery in 8% and from both arteries in 6%. The frequency of occurrence of third coronary or right conus artery arising separately from anterior aortic sinus is 2%. Myocardial bridges are present in 9 hearts and among these 4 bridges are observed in the course of right coronary artery and 5 bridges on left anterior descending branch. Conclusion: The data presented in this study provide potentially useful information for the preoperative evaluation of the newborn and may have clinical implication in sudden fetal death.